A perfect piece of pork, y'all. I can't tell you how heavenly this dish is! It's full of tasty juice, spicy crispy outer crust. My dad is the one who introduced me to this. He is the pork man! Growing up my dad would help my mom cook sometimes, and you bet it was a pork chop, baked ham, or rotisserie pork. Most families seem to eat chicken as their staple, we ate pork. It took a while to get my husband to cross over, but now he loves it just as much as me. Our kids, well they can devour a whole tenderloin together! Heat your pit to about 350. Because pork loins vary so much in size, I don't really have measurements. With the injectable butter, you want to space it out about every 2 inches or so. After you inject it, season it with slap ya mama. You want to be nice and liberal with this. 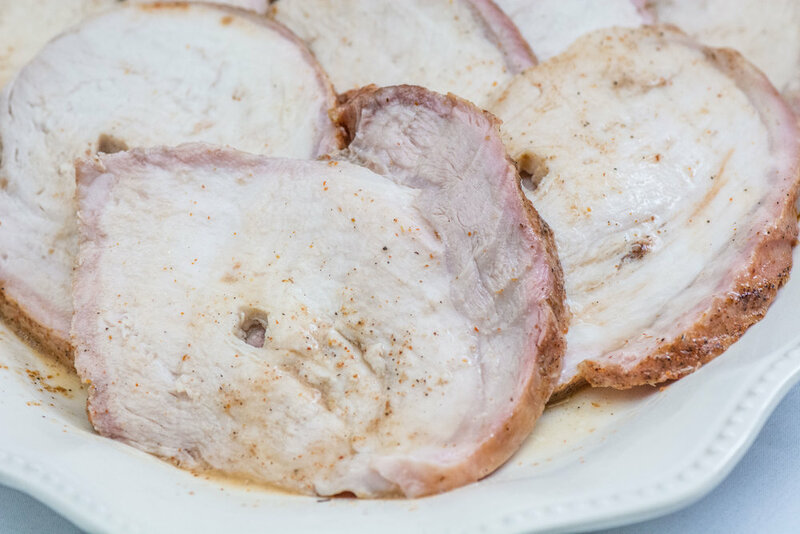 This will give your pork lots of flavor. If you don't like a lot of spice, sprinkle it lightly with the slap ya mama and season with some salt and add some garlic powder seasoning as well. Always check the internal temp!